When Tangled came out, we're pretty sure every girl out there made a mental note to somehow incorporate a thousand floating lanterns into their wedding day. 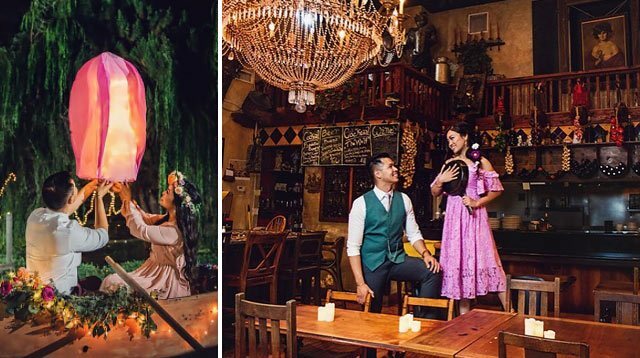 Well, with the help of photographer Jenna Henderson, this couple—Sarah and Gilbert—made that dream come true and even went the extra mile by recreating other memorable scenes from the movie. Sarah and Gilbert live in California and have always had a mutual love for all things Disney. Of their engagement shoot, Sarah told Popsugar, "Gilbert and I were in the boat, staring each other in the eyes, when 'I See the Light' suddenly starts playing in the background. It's like we stepped into the movie itself, and all the feelings and clarity kicked in. It brought me back to the time when I realized that Gilbert was more than just a friend, how my view of the world and of love shifted when I saw him in a different light, and how it is crystal clear that I'm meant to be with him." Yes, they even had a mini Maximus.